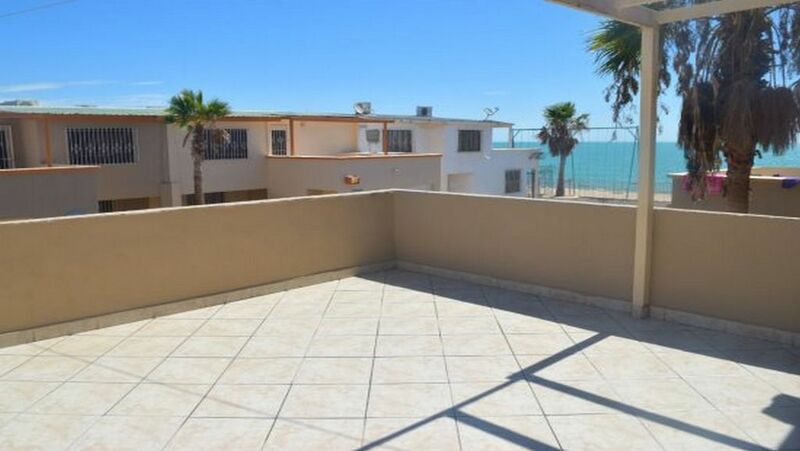 Condo 4 is in San Felipe just steps the Beach, and 2 blocks from the Malecon. this condo has WiFi. There is an open floor layout, large open kitchen with a lot cabinets, tile floor, 2 bedrooms, 2 full baths with hot water showers, large living room, bar area, chairs & table. The bedrooms and one bathroom are ground level the kitchen, living room and the other bathroom are up stairs. Step out your door and you are on the beach. There are 2 patios with a BBQ up stairs. Your kitchen has a 4 burner stove with oven, microwave, sink, refrigerator, coffee pot and dishes for 10 people. All kitchen utensil except for your special pots & pans we suggest you bring all your special items. Make sure to bring charcoal or you can buy it here to prepare that special gourmet meal outside on the patio on your charcoal barbecue... Don`t for get your dish soap, It is your responsibility to do your dishes. There is Mexican Satellite TV in this rental. ( Note: If the satellite system is down we will do are best to get it up but we offer no refund or discounts if is down ). Many channels to chose from, in both English and Spanish. Depending on your sleeping arrangements you may need to bring extra bedding, cots or air mattress for the 10 people with you. In the Winter time it gets down to 60 you may need to bring extra blankets. Your Patio area includes, chairs, table and a nice breathtaking view a of San Felipe and the beach. You have two full bathrooms in this condo with hot water showers. NO tub in this unit. You have one bathroom up stairs and the other down stairs. Includes: 2 large towels, 2 hand towels, paper in each bathroom. No wash cloths. You may need to bring towels for other guests in this unit. Your garage it is quite big with a hot water shower to get the sand off of you when you come from the beach. This condo is within walking distance to San Felipe`s landmarks. You will be close enough to the water to hear the wonderful pounding surf. You will be located at the end of a private road. Thanks for checking out my listing. I'm Erick and run MySanFelipeVacation vacation rental homes in San Felipe, Baja California, Mexico. I'm originally from San Felipe. I moved to the US as a kid and went to school in Oroville, California. I moved back to San Felipe, got married and have two beautiful kids. Growing up in the US, I learned a lot about the high standards guests expect and have brought this experience to all properties I manage. My listed homes are owned by Americans and Canadians who visit once or twice a year. When owners are not in town, the home is available to reserve. Each home's decor is unique in that it reflects the owner's style. My goal is to help you enjoy San Felipe to the fullest. When you reserve any of my homes, I will send you an email with a list of things-to-do both locally in San Felipe and some which are day trips. (I am not able to share this with you now as this site does not allow adding website links). Depending on the length of your stay, you get to chose which you'd like to do. One of the trips I recommend is doing a fishing trip to Konsag essentially a fishing and sightseeing trip. All this and more will be in my list of things to do email. One question I get pretty often is whether we use non-toxic cleaning products while cleaning properties I manage. The answer is YES . We use organic cleaning products sourced from the local Prolisa organic store. Our guests appreciate this and it is also better for our cleaning crew who regularly come in contact with the cleaning products. During your stay, please do not hesitate to contact me with any questions or if you need tips. I look forward to hosting you.